Coat of Arms: Gules a lion rampant argent, armed and langued azure between two swords points upwards of the second pommels and hilts or one in bend dexter the other in bend sinister. The O'Dempseys are of the same stock as the O'Connors of Offaly and were a powerful sept in the territory lying on the borders of Leix and Offaly known as Clanmalier. Hence the title Viscount Clanmalier bestowed by James I of England on Terence O'Dempsey, the family being then and in the reign of Elizabeth I consistently pro-English. An example of their activity in this respect will be found in the section on O'Lalor. However, they took the Irish side later on in the seventeenth century: Edmund O'Dempsey, Bishop of Leighlin, Lewis O'Dempsey, Viscount Clanmalier, and Barnabas O'Dempsey were prominent members of the Confederation of Kilkenny and with Lysaght O'Dempsey, were exempted from pardon by the Cromwellian victors in 1652: their loyalty to the Catholic King James II resulted in the loss of their estates. In earlier times, too, they were distinguished in the defence of their country and O'Dempsey, Chief of Offaly, was one of the few Irish leaders who could boast of having defeated Strongbow in a military engagement, which he did in 1172, Strongbow's son-in-law, de Quenci being killed in the battle. Dermot O'Dempsey (d. 1193), Chief of the Name, founded the Cistercian Abbey at Monasterevan. St. Evin, it may be mentioned, who established the church at Monasterevan, a place which bears his name, was the patron saint of the O'Dempseys. The Dempseys, too, were notable among the priests of the penal times, one of the John Dempsey, a relative of Viscount Clanmalier, being Bishop of Kildare. source: Irish Families, Edward MacLysaght, Irish Academic Press, 1991, page 72. The Dunn and Dempsey Clans were from the northwest portion of County Laois, Ireland. Three members of this Dunn family married three members of the Dempsey family. Michael Dempsey was born in Dublin, Ireland in September 1830. He arrived in Boston aboard the Mount Washington on July 1, 1849. It is not known if all of his four sisters arrived with him. See passenger list below. Anna Dempsey and her sisters, (Mary, Bridget and Elizabeth) were from Rosenallis, County Laois. Anna married William Dunn in Lowell, Mass. In 1858, Mary married Peter Dunn, brother of William, in Decatur, Illinois. "Four little girls from Ireland embarked with their widowed mother on a trip to Boston. Mother died in route so the 4 little girls were met by a Father John. He had a patent medicine going called 'Father John’s Cough Syrup'. he reared the girls and educated them in a convent. Their name was Dempsey." 2. Elizabeth Dempsey-Genevieve Mooney’s grandmother whose married name was James Corcoran. 4. Bridget Dempsey married Nicholas Laux. Michael Dempsey married Mary Dunn, a sister of William and Peter Dunn. Michael was the brother of the four Dempsey sisters. Note: "Father John's Medicine was originally compounded for the Reverend Father John O'Brien of Lowell, Massachusetts on June 9, 1855 at the old drug store of Carleton & Hovey. The old prescription book for that year is still carefully preserved in the Lowell Museum. Father John, as he was affectionately known, through the years recommended the medicine to his friends and parishioners. In going to the drug store to purchase it, they always asked for "Father John's Medicine", and this is the way the medicine got it's name and was so advertised. Father John's Medicine is a time tested family medicine of established value. It is a nutritive, wholesome medicine used for the relief of coughs due to colds via its soothing effect on the throat and recommended by millions over the past 130 years." Dempsey Family Arrival Aboard the Mt. Washington on July 2, 1849. Dempsey, Bridget Country of Origin : Ireland Arrival Date : July 9, 1849 Age : 25 Microfilm Source : Series M277, Roll 30. Arrival date could be error. Dempsey, Fred Country of Origin : Ireland Arrival Date : July 2, 1849 Age : 20 Microfilm Source : Series M277, Roll 30. Unknown possible relative of Michael. Dempsey, Joseph Country of Origin : Dublin Arrival Date : July 2, 1849 Age : 20 Occupation : Laborer Microfilm Source : Series M277, Roll 30. Unknown possible relative of Michael. No record for Anna or Elizabeth. Bridget on July 9, 1849-possible error in date. Michael Dempsey married Mary Dunn in Lowell, MA on February 26, 1854. Mary Dunn was the sister of William and Peter Dunn. William Dunn married Michael's sister, Anna Dempsey and Peter Dunn married another sister, Mary Dempsey. 1880 Census for Decatur, Macon County, Illinois: West William Street. Dempsey, Michael, 47 years, Route Agent; Mary age 46; Mary E. age 19, dress maker; Kate age 15; Thomas F. age 12, Lucy Ida age 9. Russell: Jessie Miss, student; Mary E. widow of Thomas A.; W. Emmett, student. Calvary Cemetery, Decatur, Illinois. See photos below. Section F: Michael Dempsey, 1830-1912; Mary Dempsey, 1831-1895; Peter J. Dempsey, 1859-1898; Lucy Dempsey, 1868-1951; Katherine Dempsey, 1866-1915. 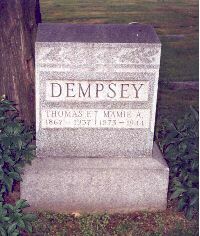 Section I: Thomas F. Dempsey, 1867-1937, Mamie A., 1873-1944. Mary Elizabeth Russell, Jan. 8, 1860-Sep. 8, 1934; Thomas A. Russell, 1859-1891; Mary Russell, 1861-1934; William E. Russell, 1890-1966; Florence Blanche Russell, 1890-Sep. 19, 1970 aged 79 years. Peter J: May 29, 1858-Sep. 9, 1898. Married Mary E. Dwyer on May 2, 1883 in St. Isidore's, Bethany. Two daughters, Lucille and Zella. Katherine: Born 1866. Died 1915. Elementary School Principal. Never married. Lucy Ida: Born 1868. Died 1951. Never married. Mrs. Mary Dunn Dempsey, wife of Michael Dempsey, died at 8:30 o'clock Tuesday evening at the family residence, 718 West William street. Mrs. Dempsey would have been 66 years old in July. She was suffering from a complication of diseases and yesterday morning a operation was performed in the hope of saving her life, but she never rallied from the shock. Besides her husband, she leaves six children, all residents of Decatur. They are: J. H., P. J., T. F., Lucy I and Catherine Dempsey and Mrs. T. A. Russell. She was born in Queens County Ireland and came to this country when quite young. The family has lived at 718 West William street for thirty-one years. The arrangements for the funeral have not been completed. Michael Dempsey Dies Suddenly; Had been in poor health but not serious condition. Michael Dempsey died suddenly at 9 o'clock Friday night at the family residence 748 West William street. His death was caused by an attack of heart trouble brought on be acute indigestion. Mr. Dempsey, who was eighty-three years old last September, had been in poor health for some time, but he had not been confined to his bed and his condition was not regarded at being at all serious. He was up and around the house as usual Friday morning and that evening ate a hearty supper. About 9 o'clock he went to his room saying that he would retire for the night and just as he entered his room he fell and died almost instantly. Lands in Boston in 1842. Mr. Dempsey came to Decatur forty four years ago. He was born in Dublin, Ireland, September 19, 1828. He went to school there until he was fourteen years old and then came to America. His parents had died when he was a small child. He landed in Boston in 1842 and went to work at once to Pelham, Mass., where he worked as a farm laborer for four years. From there, he went to Lowell, Mass., and there learned the stone cutter's trade. In that city, he married Miss Mary Dunn in 1857. They lived for a few years in Lowell and then moved to a farm near Clinton, Ill. Sergeant in 70th Illinois. He engaged in farming there until the outbreak of the Civil War when he enlisted in 1861 in company K of the Sixty-Eighth Illinois. Volunteer Infantry. He was later transferred to Company B, Seventieth Illinois and was commissioned First Sergeant. After the war he continued to farm near Clinton until 1867 when the family moved to Decatur. Here he became engaged in the stone contracting business with John Strohm and this partnership continued for twenty years. He then took a position as railway mail clerk, a position he held for ten years. For the last fifteen years, he has led a retired life. Mrs. Dempsey died here in 1895. Mr. Dempsey was a member of St. Patrick's Catholic Church and was held in high esteem by all who knew him. He is survived by five children. Mrs. Mary Russell, Miss Catherine Dempsey, principal of the Wood street school, and Miss Lucy I. Dempsey all of Decatur. J. F. Dempsey of Springfield and T. F. Dempsey of Decatur. He also leaves seven grandchildren and one great grandchild. Funeral will be held at 3:30 Sunday afternoon at St. Patrick's Catholic church. The services will be conducted by Rev. Father Murphy. The interment will be in Calvary. Michael Dempsey Dies in his Home "Civil War Veteran and Stone Contractor Sixteen Years Was 84 Years Old"
Michael Dempsey, 84 years old died in the family home, 748 West William street at 9 o'clock Friday night of heart troubles after a long illness. Mr. Dempsey had been in poor health for years, but had never taken to his bed until two days ago when his illness took a sudden turn and he became seriously ill. He was a retired mail agent and had made his home in this city since 1868. He was born in Dublin, Ireland, September 23, 1828, and was the son of John Dempsey, a seaman in the service of the Spanish navy, in command as captain of a man-of-war when Mr. Dempsey was born. His mother died when he was but a few years old and left the young son as orphan to be reared among strangers. He obtained a common school education in Ireland, and his first independent step in life was when at the age of 19, he made his way to this country crossing on the sailing vessel Mount Washington. He landed in Boston from that vessel on July 3, 1849 and went almost directly to Pelham, New Hampshire where he worked four years on a farm. A short time after leaving Pelham, he went to Lowell, Mass where he took up the trade of stone cutter. In 1856, while living in Lowell, he was united in marriage with Mary Dunn, who accompanied in the spring of the following year when he came to Illinois, settling in Clinton where he engaged in the stone contracting business until 1859. In 1861, he enlisted in Company E. 68th Illinois Volunteer Infantry as a private. After a brief service with this regiment, he was transferred to Company B. 70th Illinois Volunteer Infantry, and was commissioned as First Sergeant, and saw five months of active service until he was honorably discharged in Alton, Ill in October 1861. After being discharged from the army, he came to Decatur in the spring of 1863, moving his business from Clinton to this city, and for sixteen years was engaged as a stone contractor. In 1876, he entered the railway mail service running out of Decatur on the Wabash for fifteen years, until a short time before the expiration of the administration of President Cleveland, he left the service. He had lived a retired life since 1888. He was a prominent member of St. Patrick's Catholic church. His wife died in 1895. He leaves two sons, J. F. Dempsey, Springfield, Ill and T. F. Dempsey, Decatur, and three daughters, Mrs. Mary Russell, Catherine Dempsey and Lucy I. Dempsey all of this city and living at home. Three children died in infancy and one in early youth. He also leaves seven grandchildren and one great grandchild. The funeral services probably will be held Monday. Most of this obituary was taken from: Past and Present of Macon County, pages 690-691. Mary Dempsey Russell. Daughter of Michael Dempsey and Mary Dunn. Mrs. Mary Russell dies in Chicago. Mrs. Mary A. Russell, 76, formerly of Decatur died at 11:30 am Saturday in the home of her daughter, Mrs. C. J. Brislen in Chicago. She had been in failing health for some time, but her condition did not become critical until Thursday. Mrs. Russell, widow of Thomas A. Russell, was for many years a well known resident of Decatur. The family was then at the corner of Pine and William streets. Mr. Russell died here in 1891. Mrs. Russell moved to Chicago 10 years ago to be near her children, Mrs. Brislen. She leaves a son, William E. Russell in Wilmette, and a brother Thomas Dempsey, Decatur. She was a member of St. Patrick's Catholic Church here. The body will be brought to the Moran & Sons funeral home. Peter J. Dempsey. Son of Michael Dempsey and Mary Dunn. Past and Present of Macon County, page 644. Peter J. Dempsey was largely indebted to the public schools of Decatur for the educational privileges which he enjoyed, and when he had mastered the branches of learning therin taught he began assisting his father in the marble works, being employed there until eighteen years of age. he then obtained a position in the freight depot in this city on the line of the Indiana, Decatur & Western Railroad, and that he was most loyal to the trust reposed in him is indicated by the fact that for eleven years he continued to serve in that capacity. his work was ever free from error, and he received little criticism upon his methods of discharging his duties. Upon leaving the freight department of the railway service he obtained a position on the Decatur police force, and acted in that capacity for seven years or up to the time of his death. Mr. Dempsey was married May 2, 1883, in St. Isadore's church at Bethany, Illinois, the lady of his choice being Miss Mary E. Dwyer, a native of Morgan county, Illinois, born May 5, 1856, and a daughter of Jeremiah and Catherine (Cody) Dwyer. Her father was born in County Limerick, Ireland, and at an early day braved the dangers incident to an ocean voyage in order to become a resident of the new world that he might enjoy its better business opportunities. he settled in Morgan county, Illinois, where he engaged in farming for a few years and then removed to Moultrie county, this state, where he continued to carry on agricultural pursuits until the infirmities of old age caused him to retire. he then took up abode in Dalton City, Illinois where he lived in honorable retirement from further labor until called to the home beyond on the 18th of August, 1900. His widow, who was born in Killarney, Ireland, now owns a nice home in Dalton City, where she is greatly respected because of her many excellencies of character. the home of Mr. and Mrs. Dempsey was blessed with two children: Zella, who was born October 4, 1886; and Lucile, born January 4, 1895. It was on the 25th of September , 1898, that Mr. Dempsey was called from this life. he had held several minor offices in the city, in addition to his service on the police force, and was ever found loyal to the confidence reposed in him, discharging his duties to the best of his ability. In politics he was a stanch Republican, never wavering in his allegiance to the party. Both he and his wife were members of St. Patrick's Catholic church of Decatur, and his funeral was the second preached by Father Murphy, now the priest in that church. Mr. Dempsey was a leading resident of Decatur and had many friends here because of his genial manner, jovial disposition and unfailing courtesy. Mrs. Dempsey and her children now reside at No. 1139 North Clayton street, and she owns the property there located." Photos courtesy of Brislen family.